Stella is the new development of modern Les Gets chalet apartments with a central location in Les Gets, this family-friendly and famous Savoie ski resort. In the main street of the village called Rue du Centre, discover an exceptional residence composed of three chalet buildings built around a landscaped garden/square. At this address, the famous Stella Hotel will be demolished to make way for this brand new Stella residence offering many services and facilities on site. Its traditional and modern facade will integrate perfectly with the typical architecture of Les Gets. These apartments from 1-5 bedrooms for sale have areas between 35 and 156 m². All apartments have open views of the mountains or the village. 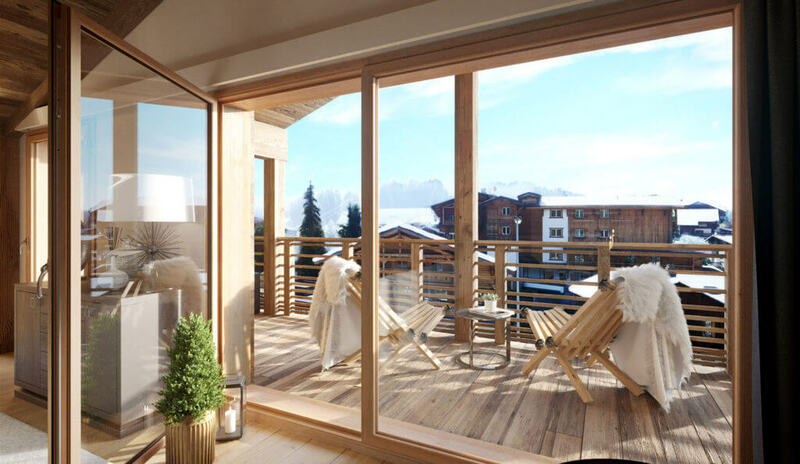 These spacious apartments are designed in a Savoyard style (made of wood and stone) and feature modern interiors with fireplaces, large windows and outdoor areas (balconies, terraces) to enjoy the view and natural light. All apartments come with a fully-equipped kitchen, one or two parking spaces in the underground garage, ski lockers and caves for storage. 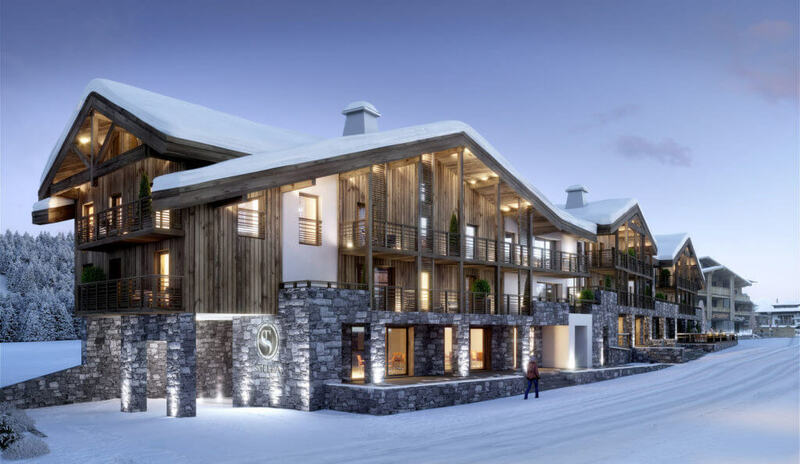 Stella is the new development of modern Les Gets chalet apartments with a central location in the resort, ideal for the family and skiers alike. In the main street of the village called Rue du Centre, discover an exceptional residence composed of three chalet buildings built around a common landscaped garden/square. At this address, the famous Stella Hotel will be demolished to make way for this brand new Stella residence offering many services and facilities on site. Its traditional and modern facade will integrate perfectly with the typical architecture of Les Gets. These apartments from 1-5 bedrooms for sale have areas between 35 and 156 m². All these Les Gets chalet apartments have open views of the mountains or the village. These spacious apartments are designed in a Savoyard style (made of wood and stone) and feature modern interiors with fireplaces, large windows and outdoor areas (balconies, terraces) to enjoy the view and natural light. All apartments come with a fully-equipped kitchen, one or two parking spaces in the underground garage, ski lockers and caves for storage. Stella apartments and the facilities? 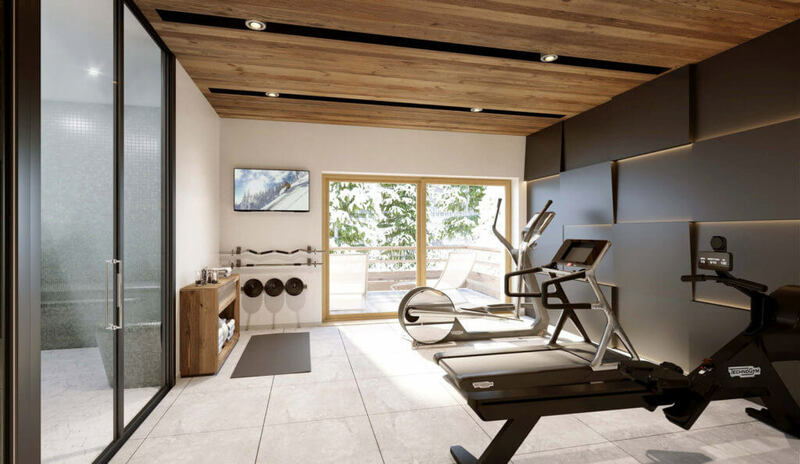 On the ground floor, residents will enjoy a wellness area with sauna and gym overlooking a beautiful terrace. A concierge service is available to the owners and other services such as airport transfers, ski passes, housekeeping, babysitting, restaurant reservations and event planning. The owners also have the opportunity to use the rental management services to rent their property in their absence. An interior design service is available upon request to help you improve your living spaces, to create and personalise the layout of your apartment so that you feel comfortable in your new home. 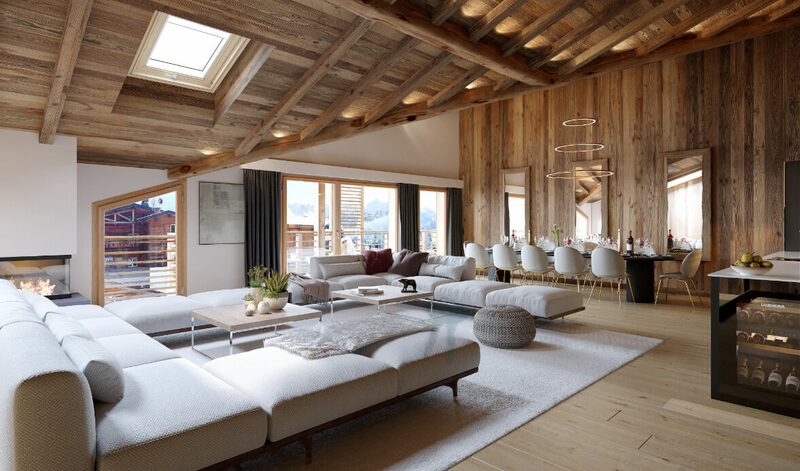 “With direct access to the Portes du Soleil, one of the largest ski areas in the world consisting of 195 ski lifts and twelve French and Swiss ski resorts, Les Gets has a strong demand for quality real estate. Property prices can sometimes reach more than 12 000 € per square meter in Les Gets, so it is not common to find the Stella residence apartments at this price, close to all amenities and ski slopes with finishes of such a large quality.